Maryland's Batman Looks Like A Real Hero : The Two-Way Businessman Lenny B. Robinson, who got national headlines when he was pulled over by police last week in Maryland while dressed as the Caped Crusader, visits sick kids and delivers presents to them. Lenny B. Robinson is a "self-made success" in the business world who is giving back some of his good fortune by donning his disguise and then heading to local hospitals to see sick kids and deliver presents "to up-and-coming superheros who first need to beat cancer and other wretched diseases." " 'Eventually, it sinks in and you become him,' Batman told me. 'It feels like I have a responsibility that's beyond a normal person. And that responsibility is to be there for the kids, to be strong for them, and to make them smile as much as I can.' He understands that might sound corny, but he doesn't care." 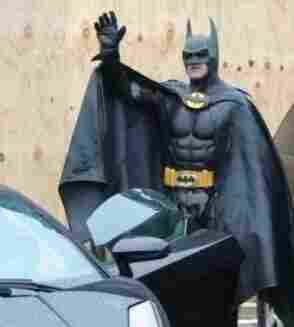 Meanwhile, there's also this video of Batman cruising the highways in his black Lamborghini.